Classic rivalries come to life! Watch classic rivalries come to life with WWE Tough Talkers Championship Takedown Ring! The action starts with PRO-ID Tech activation that allows the ring to recognise all Tough Talkers and reveals authentic WWE sounds like Superstar entrance music, crowd cheers and chants. For more authentic ring action, the WWE announcer Jojo, recognises and announces each Superstar when he enters the ring. 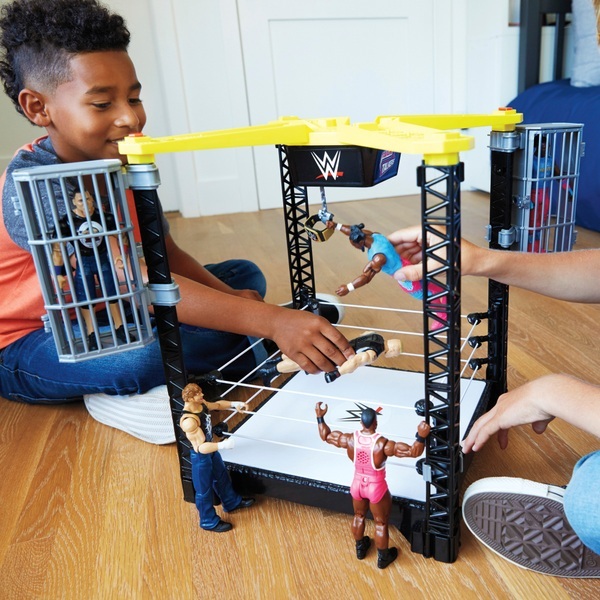 To heighten the battle action, two cages are located on either side of the ring that can "drop" down to ringside with the push of a button. Position Tough Talkers in the cages and in the ring for exciting action and interactive tough talk. Then go for the ultimate win by jumping high to claim the WWE World Heavyweight Title at the end of the match and start the three count! There's no limit to the tough talkin' action in the WWE Tough Talkers Championship Takedown Ring. The ring works with all WWE Tough Talkers single figures and two-packs (sold separately, subject to availability). Colours andecorations may vary.